I wrote a post a while back and it was sitting in draft mode. I may publish it with a previous date. I just might do that, don’t you try to stop me! 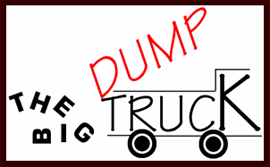 I have really ignored my site and that’s a shame because next year is the 20th anniversary of bigdumptruck.com and maybe I’ll have to fire things up and offer prizes to people who actually read my posts and can answer questions. Or people who send me money or diamonds. They could get a prize as well. Amazon has a whole thing now where you can offer items as prizes, which makes me laugh when I’m looking at something particularly expensive. I think I get seven visitors a day (probably because I update so infrequently, what with Twitter taking up the ten minutes a day I used to devote to writing here. If I offer a prize, it will likely be something incredibly useless. I think those are the best prizes of all, don’t you? The more useless the better. I can answer questions but won’t be sending any diamonds this year. I wasn’t there at the beginning. I think I started reading you around 2001/02. I did dip into the archives once or twice so I think that counts too. I can only afford useless prizes. I sponsored an award once where I gave a tabletop compost bin as a prize. Someone out there thinks of me whenever they have egg shells to compost.